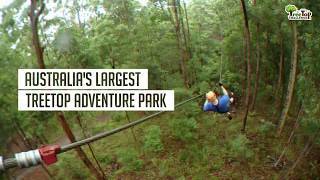 The TreeTop Challenge at Tamborine Mountain is Australia’s largest TreeTop Adventure Park with more than 120 TreeTop activities including 10 ziplines! Their courses range from easy to extreme and traverse through nine acres of amazing bushland and rainforest. To complete the entire Adventure Park will take three to four hours where you will have an amazing adventure flying through the trees, conquering your fears and having a whole lot of fun! You will hang about in the trees, balance on suspended bridges, jump on 10 huge flying foxes with some spanning over 130 metres - it's great fun, it's safe and appeals to the daredevil in everyone! Their Adventure Park is designed for the entire family aged eight and up, you don’t need any experience and it’s perfect for all fitness levels! Get ready to experience the rush of flying through the trees and gaining immense satisfaction as your conquer your fears and create unforgettable memories! Child $45 - $45 Full child ticket aged between eight and 14. Indicative Prices $55 - $55 Full adult ticket.